Leodhais Macpherson is Tyne Bridge Harriers youngest but yet one of the oldest members. His idol is Mo Farah, the World 5000 metre champion and without doubt the most accomplished runner the UK has known for many a year. 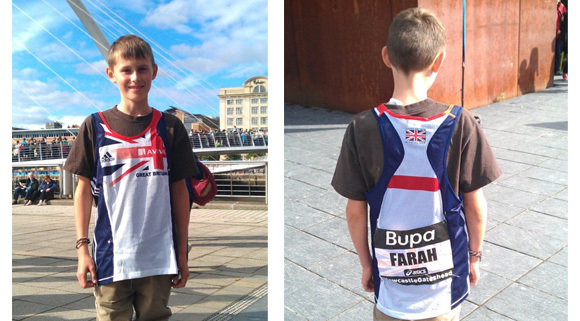 It was 2009 when Mo was pipped on the line by Andy Baddeley in the 2 mile Quayside race but straight after Leodhais was lifted over the security barriers by Uncle Mo and the little man with the big heart took his running vest off and placed it on Leodhais. The big occasion being chronicled by Bill Mcguirk in the local newspapers the following week. 2010 by Mo Farah’s standards was not his best year and Leodhais and dad were so disappointed to see Mo being taken to hospital after the European Cross Country Championships in Dublin. Having followed Mo Farah since our fateful meeting it was with sheer delight that Mo Farah came into his own in 2011 bolstered by the stewardship of Alberto Salazar and a relocation to Portland Oregon catapulted Mo into arguably the best distance runner in the World who is more than capable of getting gold in London in 2012. Well the Newcastle Quayside City Games of 2011 summonsed Mo to Newcastle/Gateshead once again and Mo did one better than 2009 when he romped to victory in front of a record crowd. Mo quite rightly after his Dageau exploits is now receiving hero status and it was humbling to see in this age of Prima Donnas and Charlatans, Mo taking at least an hour to wade through his hero worshippers and autograph hunters. Leodhais queued and finally received a signed picture from the legendary Mo but he was determined to get Mo’s UK vest that he wore for the Quayside race. After pleading and pleading and pleading x7 with his Dad, Leodhais spied Mo just about to leave to go back to his Hotel for a well earned rest and the young Tyne Bridge Harrier was called over by Mo. Mo then wrestled off his UK vest and handed it to Leodhais with his name tag still on the back before leaving the venue in a chauffeur driven car. 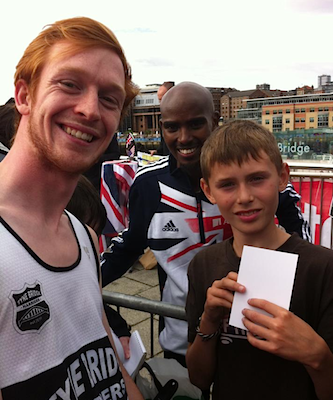 Tyne Bridge Harriers would like to thank Mo Farah for being such a gentleman to their youngest member. Mo Farah is an absolute hero. World Champion, but has kept his feet firmly on the ground. 2 year ago when we 1st met him , after his race he walked over to us with his hands on his hips shaking his head and said “I was 2nd Kenny”. It was if we might not have seen his race and might have been talking or buying a burger or something. I love this, great story about a true gent. Nice one Leodhais – shy bairns get ‘nowt! Laughing out loud at that! an excellent and memorable day for one little happy man.. oh and Leodhais was pretty pleased too.. Well done Leodhais. I’m sure it will be treasured forever. After crossing the GNR line both my legs and feet were absolutely aching so I made my way to the massage tent where i queued for about 20mins. I then went on to recall the story…”2 years ago you met a friend of mines son down the Quayside and gave him your vest which he still wears to this day. 2 years on and that same wee boy was at the Quayside once again and you greeted him by name (Hello Leodhais) and said to him that he had grown from the last time you met him. That blew him away but then you proceeded to give him your shirt for the second time”. I went onto to say that it showed the mark of him as a man that he could not only remember Leodhais’ name but that he took the time to make his day further by giving him his shirt. You should have seen the look of surprise on his face as I was relaying the story.. Fantastic!! The crowd cheered loudly and I sneaked into the front of the queue and onto my much needed massage. A hugely memorable moment!